Nourish is a cafe in downtown Inverness that caters to health nuts. Henrietta from Hungary works there. I must admit that when I started my day that I was feeling a bit down. I recalled a book given to me by Gale Marrone called the Tao of Travel by Paul Theroux. The book is a collection of quotations from not just Theroux, an accomplished travel writer, but of travelers from throughout history and from all over the world. There was a chapter about the loneliness of the road. I was thinking about that this morning, and there was a part of me that thought I might just go the day without speaking to a single person. But the journey would not have it. As I waited for a bus to Loch Ness, I found a little place to grab a bite to eat and get a coffee. Nourish is a local Inverness cafe that caters to health nuts. There are posters about meditation and ukulele jam sessions. The woman who was tending the shop was Henrietta from Hungary, and she was just as pleasant as person can be in the morning. She made me a smoothie, brought some coffee, let me plug in my phone (I learned from Culloden), and then started asking me about myself in an English flavored with that unique Eastern European accent. “What part of America are you from?” she asked. I told her about South Carolina and about where I was planning on going. I asked her if I should go to Hungary. “Yes. You go to Hungary and go to a Turkish spa,” she said. I said that I might just do that. I asked her if I could take her picture, but, like Christine, Henrietta is a bit camera shy. My interaction with Henrietta lifted my spirits a bit, and I headed to the bus stop. 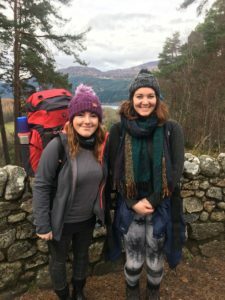 Bes (left) and Amy (right) are from Dorchester, England and are hiking through Scotland. There I met two young women who were waiting for the same bus. Bes and Amy are from Dorchester, England and are going to be hiking back down to Edinburgh. We started talking because we were a bit on edge because our bus was a few minutes behind. But after a few minutes, it rolled up, and we hopped on. Amy has just graduated from university with a master’s degree in history and wants to travel and write her own blog. How crazy is that? I asked them about Dorchester, which is on the southern coast of England. I laughed and said that I had taught him. The Waterfall Cafe in Foyers is right at the entrance to the path to the beautiful Falls of Foyers. I was thinking about how cool it was that these different townships or regions in Great Britain celebrated their literary history. For those of you who don’t know, January 25 will be Robert Burns day. There are signs all over Inverness about it. 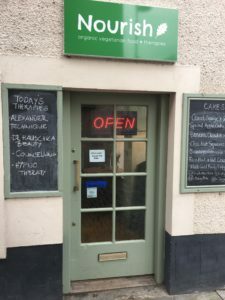 By the time we reached Foyer, a little town at the southeastern portion of Loch Ness, I was feeling reinvigorated, and I was looking forward to my walk. 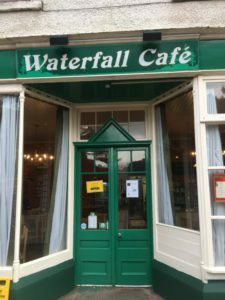 I had a nice meal, haggis and cheese on a panini with a beef goulash, at the Waterfall Cafe in Foyers. I also had a nice chat with the women who worked there. I needed to purchase a pen and asked if they were sold there. I laughed and headed on my way. After a nice two hour walk along Loch Ness, I got back on the road that led to Dores. I wanted to go to a pub that J.D. had told me about the day before in Culloden. I had walked a number of miles, but I still had about 6 to go. So, I figured I would try to hitch a ride or that hopefully a bus would come along. Enter Daryn, the star of the day. About nine cars have already driven past, when he pulls up next to me. He rolls down his wind, and the sound of Metallica comes roaring out along with his voice. I did, and we were off. Daryn is in the army and even served as a guard at Buckingham Palace. Now, if you have ever seen the guards at Buckingham Palace, you know that they can’t speak to anyone. Daryn is no longer confined by those restrictions and he was as friendly and conversational as a person could be. 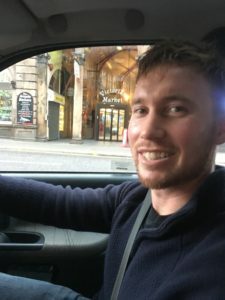 He told me that he was on leave and had been visiting his girlfriend but that now he was heading up to Inverness to hang out with his blokes at a pub. He told me that he was going to be stationed soon in Iraq, but he was good with it because there was extra pay. I told him that I always made an effort to thank American men and women who serve in the military, and, in that spirit, I thanked him for his. When we reached Dores, I asked him if I could write about him in my blog. I laughed and explained who Stella was, and soon he was off. That is the point where my day could have gone very wrong, very quickly. First, the pub in Dores that is so popular with the locals, even Daryn had been there before, was closed for renovations. Secondly, I had left my bag with my journal and water bottled in Daryn’s car. I didn’t realize that yet. I went around the corner of the pub to get some more pictures of the loch, and, when I started back for the road to wait for the bus, here comes Daryn. “You left your bag,” he said, lifting it up in the air. I thanked him and told him that the pub was closed for renovations. Daryn loves the army, Metallica, his dad, and being outdoors. He’s a really great guy and did me a solid by giving me a lift. So, away we went again. When Daryn dropped me off, I told him to have fun with his mates and to be safe when he is deployed, and then I asked him for a picture. He obliged. Wherever you are, thank you! Thus ended my last day in Inverness. I head north tomorrow. Hi Luther, I am loving reading your blog and seeing your wonderful photography. I am also glad that you are meeting such lovely people on your travels. Ah, what a joyful ride! Thank you my friend!